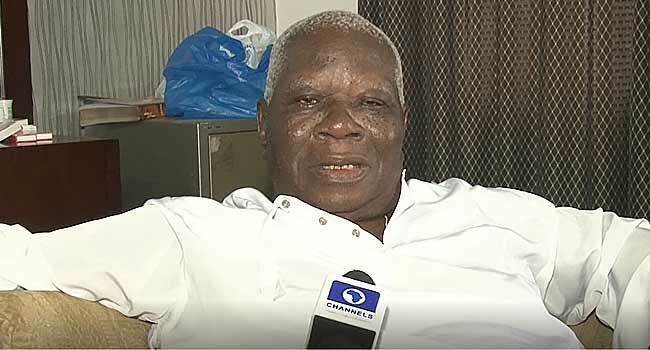 The police have paraded a man suspected to be the informant in the search of the home of elder statesmen, Edwin Clark, in Abuja. Force Public Relations Officer, Mr Jimoh Moshood, paraded the suspect identified as Ismail Yakubu on Wednesday at the Police Headquarters in the nation’s capital. Moshood said Yakubu is from Waru village in the Apo district of the Federal Capital Territory. He also revealed the names of the four police personnel allegedly involved in the raid of Clark’s residence in Asokoro on Tuesday. They are David Dominic, who is alleged to have led the team in the search, as well as Godwin Musa, Sada Abubakar and Yabo Paul. The police spokesman disclosed that Dominic has been queried while the three others were undergoing orderly trial for the appropriate punishment to be meted out on them. He also said Yakubu would be arraigned in court for giving false information and telling a falsehood to mislead police action. He explained that the police receive information from members of the public on daily basis and were promptly used to prevent and detect crimes and criminalities in the country. “The police, therefore, has the statutory rights to execute a duly obtained search warrant in any premises where it has actionable intelligence or information that incriminating items or exhibits used to commit crime or about to be used for criminality with the aims of recovering them to prevent the commission of such crime or to detect the crime that have been committed,” he added in a statement. The Force spokesman insisted that any officer who was to carry out the execution of a search warrant must follow the laid down procedures within the law. He warned that an officer would be made to face the consequences of violating the rule of law, where such procedures were not followed. Four police officers allegedly from the IGP’s Special Tactical Squad had stormed Clark’s residence in Asokoro, Abuja with a warrant to search for weapons. But elder statesman condemned the incident which he said was an embarrassment and threatened to take legal action against the force. Moshood had said that the Inspector General of Police, Mr Ibrahim Idris, was not aware and did not order the raid. The police, thereafter, sent a delegation of top officers to visit Clark and apologise for the incident.